Install a worry-check gateway, keep the worry virus out! Worry is like a virus. It will arise. You can’t stop it from arising in you. But you avoid being led by it! What the gentleman suggests as a possible method to keep out computer viruses, applies to our lives as well. Most of us are, subconsciously, constantly, worrying. We are led by our worrying. From relationships to our children to our finances to health to careers to the state of our countries and world, we worry about anything and everything. Now there’s no logic or pre-qualification required for worrying. The human mind thinks 60,000 thoughts a day. And if unchecked, if untrained, the mind simply keeps spewing worrisome thoughts among several other debilitating ones like anger, grief, guilt, fear and such. So a worry is like a wave in the ocean. If there is an ocean, waves will arise. If there is a mind, a worry will arise. But you have to realize that you have the ability to prevent that worry from affecting you. You may be touched by the worry, but you can choose to be unaffected. Being able to do this consistently is what intelligent living is all about. One way to be untouched by a worry is to simply postpone it. Most of us do just the opposite. We miss the beauty and magic of living in the moment by postponing living, by postponing happiness. We indulge in worrying almost 24×7. 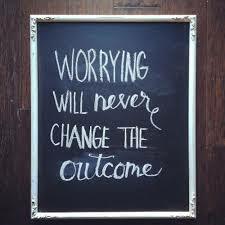 Instead try postponing worrying for a change. Let’s say, you have to pay a bill and you don’t have money. A worry arises dramatizing the consequences of being unable to pay that bill. Just postpone the worrying and instead focus on what you can do, within your means, with your abilities, to earn the money to pay the bill. Simple. And if you can’t pay the bill, on the D-date, well, face the reality then. How could worrying have ever helped you pay off the bill? Think about it! The other way to deal with worry is to practise ignoring it. When it arises, just ignore it. Your ability to ignore worry will be honed when you consistently remind your mind that worrying is of no use. Truly, no situation in your Life, or even in the world for that matter, can be solved by worrying. Only concerted, focused action leads us to solutions. So why worry? When worry arrives, ignore it. So, install a worry-check gateway in your mind. Keep the worry virus out. Postpone worrying to start with. And you will instantly, magically, start enjoying the moment. This ability to enjoy what is, is happiness! Author AVIS ViswanathanPosted on October 8, 2015 March 14, 2016 Categories Anti-Virus, Art of Living, Happiness, Inner Peace, Intelligent Living, Mind, Virus, WorryingLeave a comment on Install a worry-check gateway, keep the worry virus out!